I often receive emails that include things like, “Do you have any suggestions or advice?” Occasionally, I ask if they’d like to talk. These calls are part listening and advising, but mostly, they’re coaching. Confusion gradually gives way to clarity. Motivated callers end up designing their own path forward. It takes between thirty or sixty minutes. At the end, they think I’m smart. But, in reality, they had all the brains. Coaching is less than counseling, consulting, advising, or acting as a sounding board. I don’t need to know you, understand your business, or have more talent than you, to coach you. I need forward-facing curiosity. 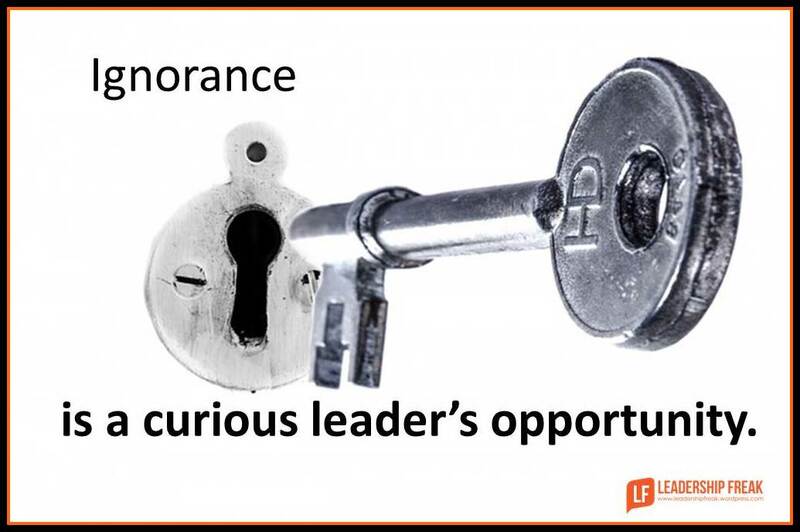 Ignorance is a curious leaders opportunity. Forward-facing curiosity creates clarity that’s followed by energy. Backward facing curiosity often escalates confusion and helplessness. Forget disappointments with past performance. Refocus on a short-term objective that aligns with a long-term goal. Determine two or three behaviors that are likely to move the ball down the field. Concentrate on the next play, not winning the game. Follow the energy. Constant pushing drains people. Find the pull. Coaching is a forward-facing conversation about behaviors that deliver results. Coachees create their own solutions. Coaches ask questions, clarify answers, and establish accountability that’s designed by the coachee. What have you tried that didn’t work? What should you stop doing? How would you describe the behavior? What will you not have done, if you fail? How will you assess progress? Coaching-leaders use questions to identify and asses behaviors that move the ball down the field. How might leaders maintain forward-facing curiosity while solving problems? All those elements are factually accurate. The problem is disseminating. A critical thinker thinks like a child; few filters to contaminate; curiosity replacing myopic. My observations have seen people will answer “that” question “each” question with a single answer. There I’m done, what now? do you have a couple examples where you found the pull with people that worked for you ? What makes that so energizing? How can we do more of that? What do we need to stop doing that blocks this energy? Who else can we involve? One test for pull is dropping a casual question on someone, “Where could we take this…,” for example. If their eyes light up, throw gas on them, give them resources, and get out of the way. There are people on the team who are like pushing ropes. Don’t spend too much energy pushing them. Focus your attention on people with positive energy – people with pull. I’ve pushed and I’ve been pulled. I’ll take the latter. Dan, can you please put an apostrophe in “leader’s” in the graphic? This grammar freak is freaking out! Thanks. Thanks Barbara. I appreciate the heads up the grammar mistake. Thanks also for sharing your insights re: #4. I agree with all that you suggest. However, my struggle is coaching those that have no desire to be coached. I try a lot of your questions with them, but the answers usually end with with accusations and blame rather than forward-facing motion. Could you do a post on how to reach those that don’t want to move forward? Thanks Jill. Being coach-able is central to success. You can’t coach someone who doesn’t want to grow. I can tell when I’m talking to someone who doesn’t want to move forward. They have 10 reasons why nothing will work. Stop give them suggestions. All they’ll do is shoot them down. Listen to what can’t be done. Don’t fight them. Ask, “Can we fix this?” Find an issue where they say yes. Don’t give them a yes. Try, “I hear what we can’t do. What can we do?” … Then wait…wait … wait for them to answer. Avoid adversarial conversations where you’re convincing them. They have to convince themselves. We should remember that coaching isn’t the answer for every leadership situation. Thanks, Dan! I use the “What can we do?” a lot in my work. I think my comments tie in nicely to today’s post about engagement. Thanks for making the connections for me! Clarity is addressed through confusion. Thank you for posting this. There are times when not knowing how to move forward through various issues can be challenging. I appreciate you not holding back information that benefits others. Thank you again for your kindness and expertise. A very timely post for me Dan. I am using your 10 questions to move myself forward. Thanks Coach! Change is great. Curiosity is key. Your 10 questions are a great start for anyone to get unstuck and move forward. Make sure you know which way the ball is supposed to be going! Make sure you know the “game” sufficiently well, otherwise you risk moving the ball the wrong way. I’m a fencer, not a footballer, so your analogy would be something that would trigger me to check! Your energy, time and enthusiasm are finite. Unless you know what success is, you risk wasting your precious resources doing something that cannot help you. In the list of 10 questions to move the ball down the field, I think number 1 is the most crucial, and often the most difficult for some people to have a ready answer. “What do you want?” It’s so simple, yet so difficult sometimes to articulate. I’ve always believed that mistakes / failures are (1) expected if you take risks seeking optimum outcomes and (2) not bad as long as you learn from them [Edison quote: “I have not failed. I’ve just found 10,000 ways that won’t work.”]. With this in mind, I admit some confusion related to Mark #2 and Questions #3 and #4. The Questions fit with learning from previous mistakes / failures; but the Mark seems to contradict the questions. Your thoughts, as always, much appreciated. Great post warranting consideration as always. What are some examples of backward facing curiosity? Thanks Kelly. Here are a few. Asking about problems, failures, and short-comings. Wondering how to get back to a more glorious past. Asking “why” something happened. To me, the first and third examples make good sense IF the goal is to engage in forward thinking curiosity to reach clarity and more optimized outcomes – never to dwell on the past mistakes… The second example is really wrong to me!!! No matter how good things were in the past, they can ALWAYS get better in the future. Seeking to return to the glorious past is either laziness or total lack of reality.